Heat oven to 375°F. Mix oil, thyme, marjoram, salt and pepper. Grate 1 teaspoon peel from lemon; add peel to oil mixture. Cut lemon into fourths; place in cavity of chicken. Fold wings of chicken across back with tips touching. Tie or skewer drumsticks to tail. Place chicken, breast side up, on rack in shallow roasting pan. Brush oil mixture on chicken. Insert meat thermometer in chicken so tip is in thickest part of inside thigh muscle and does not touch bone. Roast uncovered 45 minutes. 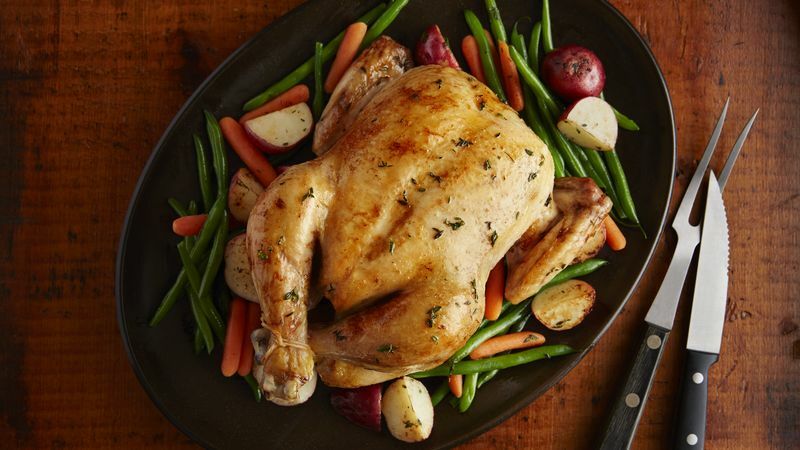 Arrange potatoes, carrots and green beans around chicken; brush chicken and vegetables with oil mixture. Roast uncovered 30 to 45 minutes or until thermometer reads 180°F and juice of chicken is no longer pink when center of thigh is cut. Let stand about 15 minutes for easiest carving. Remove lemon and discard. Place chicken on platter; arrange vegetables around chicken. Serve with pan drippings. If you don't have a roasting pan, you can use a broiler pan or a 13x9-inch rectangular pan. For easy cleanup, line the roasting pan with aluminum foil before placing the chicken on the rack in the pan.